Warner Bros.); 1950s—regular guest on Art Linkletter's House Party show (radio and TV), and special makeup artist on Queen for a Day for 11 years; then worked at Universal for two years, and again at Warner Bros.: did the TV series The Munsters and The Bill Cosby Show . Ern: 1924–28—worked at Warner Bros., then at RKO, 1929–31, 20th Century-Fox, 1935–39, then freelance; 1950s—did Hollywood Glamour Show on TV; cosmetic salesman in New York. Wally: worked as mechanic, then at Brunton studio and Warner Bros.; 1926–69—head of makeup department, Paramount. 1935–65—Mont, Perc, Ern, and Wally set up House of Westmore beauty salon, run in later years mainly by Perc (Ern sold his share, 1939). Bud: apprentice to Perc at Warner Bros. at age 15, then worked at 20th Century-Fox and as head of makeup department at Eagle-Lion Studio; 1946–70—head of makeup department, Universal. Frank: worked at House of Westmore from age 15, then apprentice at Paramount, 1942; worked at Paramount after the war, then freelance, including the TV series Bonanza , It Takes a Thief , The Jimmy Stewart Show , Planet of the Apes , and Kung Fu . Award: Ern: Special Academy Award for Cimarron , 1930. Died: George died (suicide) 12 July 1931; Mont died of a heart attack in Hollywood, April 1940; Ern died of a heart attack in New York City, 1 February 1968; Perc died of a heart attack in Hollywood, 30 September 1970; Wally died 3 July 1973; Frank died 14 May 1985. Westmore, Frank, and Muriel Davidson, The Westmores of Hollywood , Philadelphia, 1976. Westmore, Perc, "Make-Up and Coiffure," in Movie Merry-Go-Round , edited by John Paddy Carstairs, London, 1937. Westmore, Perc, in Hollywood Speaks! An Oral History , by Mike Steen, New York, 1974. Westmore, Frank, in Photoplay (London), January 1977. Westmore, Frank, in American Cinematographer (Hollywood), July 1984. Elkins, M., "The Westmores: Sculpting the Faces of the World," in American Cinematographer (Hollywood), July 1984. Laimans, S., "In Laimans' Terms: George Westmore, Movie Makeup Magic," in Classic Images , no. 203, May 1992. Essman, S., "Behind the Masks," in Cinefex (Riverside), December 1996. A family of makeup artists all working in Hollywood would deserve a place in film history on this basis alone. However, while the six sons of George Westmore (himself best known for restyling Rudolph Valentino's hair) may not have all achieved the same degree of prominence, their careers offer more than mere curiosity value. Employed at different studios, most of their work was of the kind that does not attract attention to itself. The best known of the brothers, Bud and Wally, gained their fame through work in the horror/fantasy field where the makeup artist has the most scope for the creation of spectacular effects. 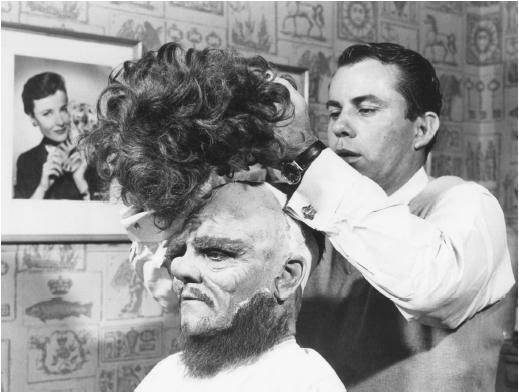 Bud Westmore had the best opportunities to make a name for himself, in that from the mid-1940s until 1970 he was head of makeup at Universal Studios (he took over from Jack Pierce, the man responsible for Boris Karloff's monster makeup in Frankenstein ). The studio's move from horror to science-fiction brought about the need for bizarre new creations. Of these, the monster in The Creature from the Black Lagoon , co-created with Jack Kevan, is Bud Westmore's most famous work. Though obviously a man (Ricou Browning) in a rubber suit, the design is striking, and some of the eerie underwater scenes are well enough staged to make audiences suspend their disbelief. Less well known, but almost as impressive, is the Metaluna Mutant from This Island Earth , with bulging eyes, visible brains and pincers. Perhaps the most ambitious assignment on which he worked was one outside the fantasy genre, the 1957 bio-pic of Lon Chaney, Man of a Thousand Faces . If ultimately he failed to recreate the latter's makeup designs for James Cagney, it is no reflection on his skill. No one but Chaney would be willing to endure the extremely painful devices he employed to distort his face for the required grotesque effect. The lurid designs created by Bud Westmore for 1950s science-fiction sagas work well within the context of the overall films. Wally Westmore's work in fantasy films, while exhibiting talent, does on occasion go over the top. His makeup for the 1932 version of Dr. Jekyll and Mr. Hyde , which helped Fredric March win an Oscar, is hopelessly overdone, making the embodiment of the doctor's perverse desires look like a comical ape-man. The ugly "manimals" in Island of Lost Souls are far more effective. Perc Westmore seems by and large to have pursued a more mainstream career in the makeup field. His most notable departure into the outlandish was Charles Laughton's makeup in the 1939 remake of The Hunchback of Notre Dame . Aided by George Bau, Westmore created an image of extreme ugliness (to the extent of having one of Quasimodo's eyes lower than the other) which, in conjunction with Laughton's acting, is at the same time very touching. It may seem unfair to acclaim work that by its very nature must draw audience attention to itself while more subtle effects go unappreciated. There might be a case for arguing that The Creature from the Black Lagoon required no more skill than Frank Westmore's transformation of Shirley Maclaine into a Japanese girl for My Geisha . Had none of the brothers ever ventured into the realms of the monstrous or bizarre, however, it is unlikely that they would be so well remembered, whatever their talent. Not even membership in a Hollywood family dynasty can compare with bringing to life an archetypal screen monster. I believe that's Mont Westmore playing an actor and applying a crepe beard to himself in a backstage sequence in Buster Keaton's "Spite Marriage." My source for this was Buster's widow, Eleanor.